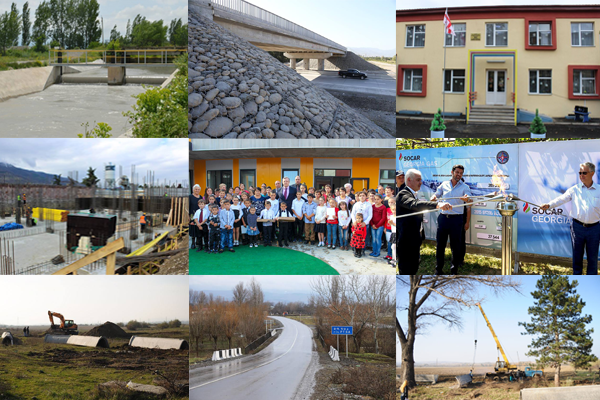 Construction of roads and bridges in Shida Kartli Region - 343 rehabilitative projects has been implemented. Construction of water supply and sewerage system - for the rehabilitation 496 projects has been implemented. Water delivery is organized for 10000 hectares in Shida Kartli region, Projects planned in 2016 serves arranging the irrigation system on the above mentioned hectares and on the additional 1000 ha. Construction of Schools and Kindergartens – 226 projects has been implemented for the rehabilitation. 294 projects have been implemented of rehabilitation Sports, Cultural and Recreational infrastructure. 21 New Dispensaries opened in 2013-2015. Currently, the construction of Emergency Medical Clinic is underway in Village Tkviavi, Gori. Former Hospitals in Kaspi and Khashuri was rebuilt for living flats for durable Settlements. Currently, the construction of the New Building in underway for 430 families in Gori. 97 Villages has been gasified, where 23 892 families (67 485 inhabitants) live. Out of the 56 villages are situated near the demarcation line of the occupied territories. Electricity was installed in 129 villages. In total, 20 051 households (93133 inhabitants) will use the electricity. Out of the 7 villages did not have electricity over the years.